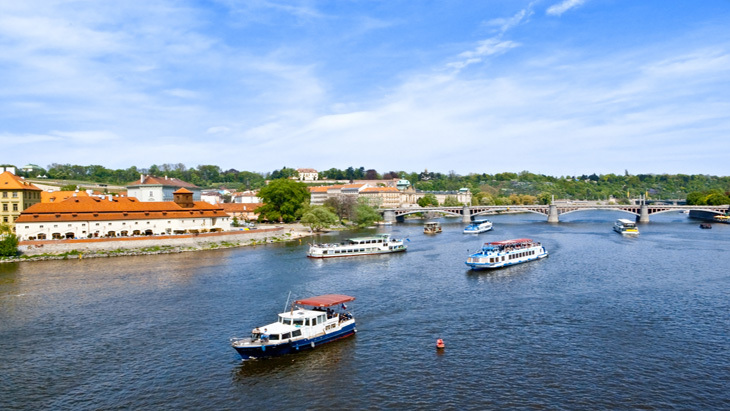 There is a great number of shipping companies operating both passenger and water transport on the Vltava River in Prague and its surroundings. There is an extensive fleet of ships of various sizes and amenities. Whether you want to just take a cruise along the Vltava river, or have a gourmet meal, hold a corporate party, professional conference, get engaged or even married, Prague boat companies are ready to fulfil any of your desires. In addition, you can take a cruise combined with a tour of a museum, or Prague’s Lesser Town district. There are also regular shipping lines, such as the popular lines to the Prague Zoo, which leave from three platforms now - the Kampa dock (the only Czech certified environmental dock), the dock at the Hospital Na Františku and Rašínovo embankment. Don’t miss out on this enjoyable way of transport, especially if you’re visiting with a family. It is essential that you book your ticket in advance, which can be easily done via the website of a particular company. All the sightseeing cruises are led by professional and licensed guides with a profound local knowledge. You will learn about the hidden treasures of the city in an entertaining manner and thus make the most of you time in Prague.